The Gold Prospectors Association of Finnish Lapland was established at 18th September 1949 during the hectic gold rush in Lemmenjoki. The initial goal was to improve the standard of living in the very primitive wilderness by developing transport connections, arranging post service and so on. 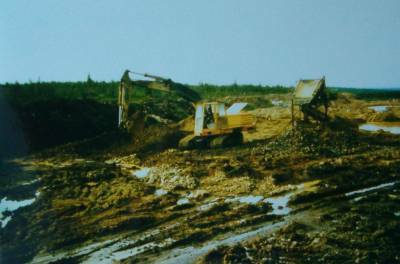 From the very beginning the development of professional gold mining was seen important. Co-operation with Geological Survey of Finland and the Ministry of Employment and Economy took a special role in the association. The activity stalled, tracking the world market price of gold, at 1960’s followed by a new rise at the 70’s. The association started to preserve old gold panning objects and inventing gold panning competitions in Tankavaara revived the skill of panning gold. Later these activities were transferred to the Gold Museum that was conveniently established a couple of years earlier. 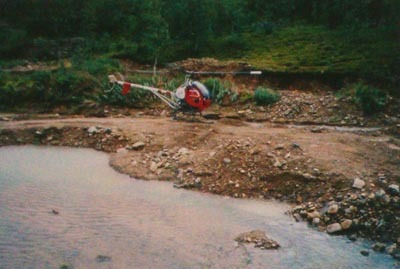 Nowadays the association has over 3100 members prospecting gold at 300 claims and 30 open pit mines in Finnish Lapland. The mission of the association is to secure and enhance the rights for prospecting gold. The task is difficult in the ever-increasing pressure for nature preserving. One third of Lapland is some sort of preservation area by Lemmenjoki National Park , Urho Kekkonen National Park and Hammastunturi Wilderness Area being the most important at the gold fields. Natura legislation from the European Union has also it’s own impact on prospecting activities. Different opinions on the interpretation of legal code of mining vs. regulations in the preservation area led into legal proceedings between Metsähallitus (administration of state’s land and water areas) and private gold prospectors throughout the 80’s and half the 90’s. The private prospectors, supported by the association, won all the cases and gold mining activities were allowed to continue. At the moment, the legal code of mining is just being modernized and there is a fear of nature preserving taking edge over mining as seems to be the aptitude in the community. According to the final proposal for the law, digging with machines shall be banned within 8 years transition period in Lemmenjoki. This practically puts an end to the professional placer mining in whole Europe as Finland is the only country with economically sound placer depositsfor professional mining. There are about 20-40 (part time) professional gold miners in the association. Most of the professional miners use hydraulic excavators in conjunction with bar or trommel screens. Environmental aspects are fulfilled with biologically decomposing oils and recycled water in washing. 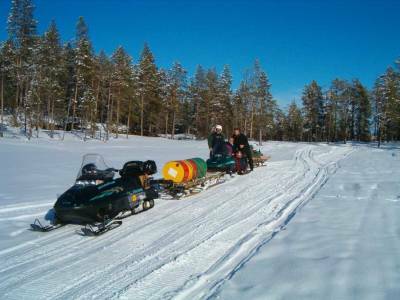 Dredges are also used, especially by recreational prospectors at Ivalojoki and Sotajoki area. All of these are strictly regulated and controlled by the authorities. Water samples are frequently taken below the claim for making turbidity and other quality analysis – all at the expense of the claim owner. The prospectors are obliged to renovate the landscape when the area has been processed. Therefore it can be said that an assiduous old timer using pick and shovel made more environmental effect to the river and landscape than today’s prospector with hydraulic machines. In most cases all this takes place in the wilderness, where the distance to the nearest road may be 30 km or more. Thus most of the service to the gold area must be done during wintertime by snowmobiles. The ground is frost and covered by snow about 8 months in a year. The prospectors their self are living in harmony with the arctic nature and wildlife. The landscape is filled with fjelds grazed freely by reindeers. 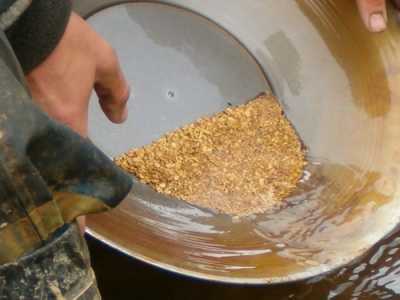 As a conclusion, the expenses for gold prospecting are enormous, compared to many other gold fields on the globe.The vast majority of our members are recreational prospectors, digging by shovel and sluice box. The association has lowered the threshold of starting by providing claims in different areas for the members to use. 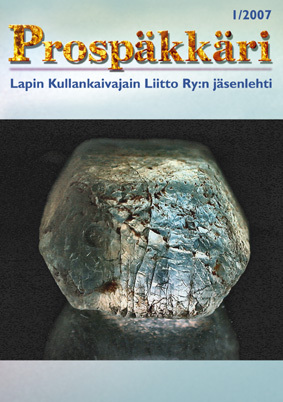 By joining the Gold Prospectors Association of Finnish Lapland, besides other benefits, you get a newsletter ’Prospäkkäri’ four times a year and a right to go out and try your luck as a prospector. The annual outcome from placer mining is about 25 kg gold. The professional miners are producing about 20 kg with their hydraulic machines while the recreational prospectors are responsible of the remaining 5 kg. Bigger nuggets are extremely rare – the record is still 395 grams from year 1935 although there are 6 nuggets over 50 grams from this millennium. Even 1 gram piece is something that doesn’t come to every prospector. Precious stones are found as a by-product, star sapphire and almandine garnet being the most common ones. Most of the nuggets find their way into jewelry together with Lappish gemstones. The price of Lappish gold and gold jewelry is quite high because of the expenses paid in the production process, as described earlier. The traditional profession of prospecting and panning associated with modern equipment is vivid and living in the Finnish Lapland. This is absolutely unique in the whole Europe – therefore worth fighting for.